Spring-Action Door Catch. 7/16"h x 5/8"w x 1-5/16"L. This clear, two-part polycarbonate door catch has a spring-like tenstion for secure closing. 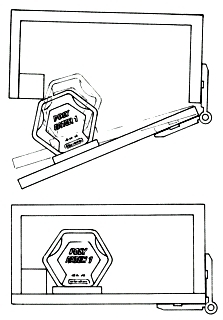 Polycatch Door Closure- The unique hexagonal design of this clear polycarbonate catch has a flexing action that provides secure closing and easy openings of doors and lids. 3/4"h x 3/4"w x 3/8"d. Instruction sheet available upon request. Mag-Catch Magnetic Door Catch-Small-7/8" glue-surface base. This high-impact clear acrylic magnetic door catch requires no direct metal-to-metal contact so it can be easily bonded with solvent right onto acrylic doors, lids, and panels without the need for screws or rivets. Holds doors securely yet opens with just a slight pull. Bonds to acrylic, ABS, styrene, and polycarbonate with Craftics Solvent Cement.